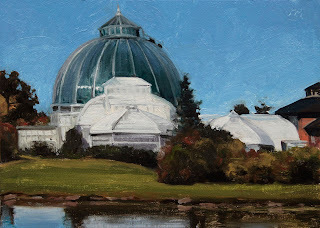 Belle Isle Conservatory oil on linen panel, 5"x7". This is one of the beautiful parks in Detroit, where you can watch the Great Lakes Freighters go by. Today is my birthday and we will celebrate with the children in our neighborhood and their parents this evening, with cupcakes my wife made. 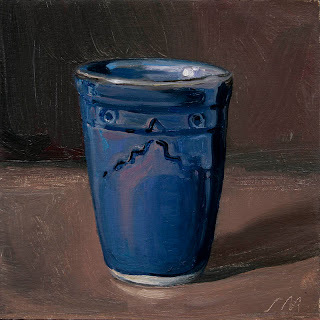 oil on linen panel, 5"x5"
Cafe' au lait bowl, oil on panel, 6"x6". 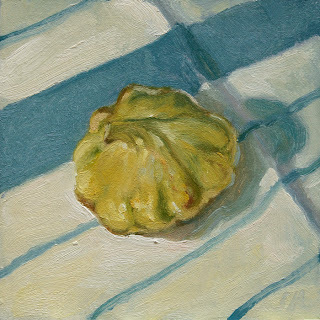 Squash on Blue & White Towel, oil on linen panel, 5"x5". The local market has such wonderful items to paint and eat. 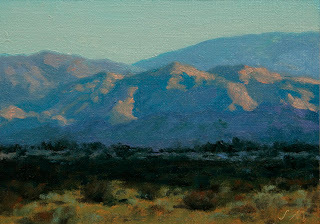 Evening Light, oil on linen panel, 8.5"x11". Small downriver industrial building in Detroit. I love working with light and shadow. 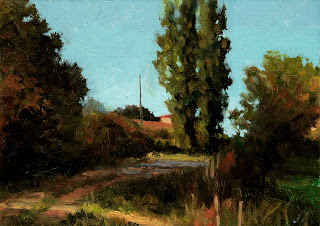 Southwest France #16, Oil on prepared paper, 4"x6". 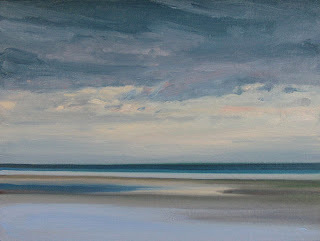 A continuing series of paintings of Southwest Franceago. S.W. 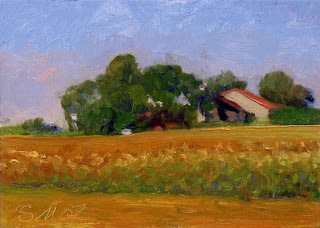 France, Oil on prepared paper, 4" x 6". 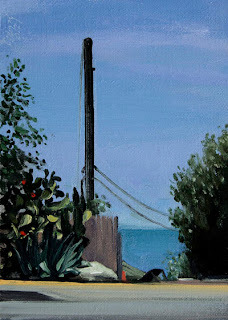 A continuing series of paintings from a trip to France a couple of years ago. 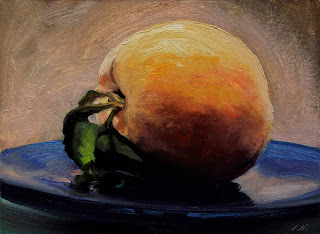 Blue Plate Peach, Oil on prepared paper, 5"x7". More from the local farmers market. 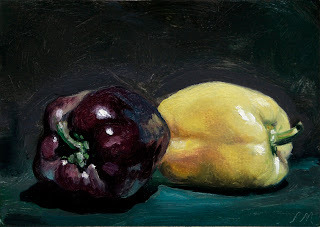 Two Peppers, Oil on Prepared Paper, 5"x7"
These are from the local farmers market. Adam St. 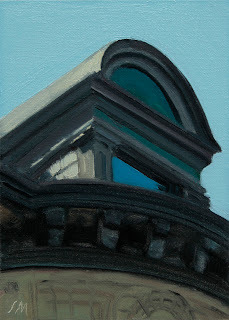 Window, Oil on linen/panel, 7"x5". One of the many interesting buildings in downtown Detroit. 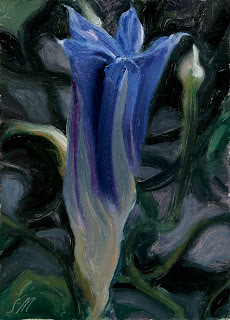 Studio Morning Glory, Oil on Paper, 7"x5"
Something a little different today. These beauties are growing on the side of my studio and I always say I have to do some paintings of them, they are so charming. I wish they lasted longer, as soon as the sun hits them they start to wilt, and start fresh the next morning. 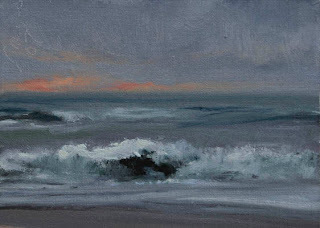 Siesta Key #10, Oil on linen/panel, 5"x7"
Detroit Lime Co. oil on linen/panel 7"x5". 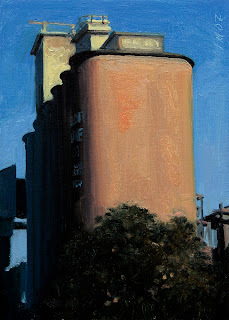 This is the first Detroit Painting to be added to the Daily Blog. I like the way the warm afternoon sun plays against the deep blue sky. 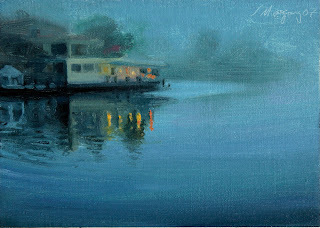 We were riding our bikes over the intercoastal bridge after watching the sunset and this was the view, It reminded me of the Whistler nocturnes that we had just seen at the High Museum in Alanta Georgia. some of it is due to pollution coming from Los Angeles. 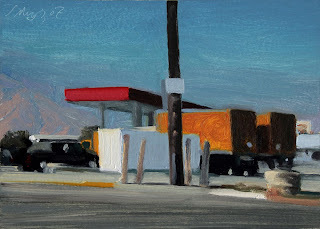 Pacific Coast Highway #1, Oil on linen/panel 7"x5"
From our last trip to California, it is south of Los Angeles. This was the view from our roadside table at a resturant on Highway One. I thought it made an interseting composition with the vertical and horizontal bands and the plants making dark abstract shapes. 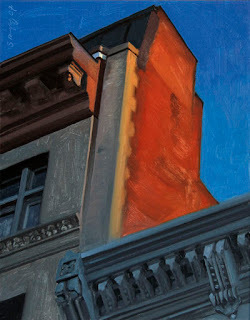 51 Greene St. doorway, oil on linen, 42"x36" At David Klein Gallery.This is the painting that the paint was also used for the small painting in the last post. I love painting the old cast iron buoldings in lower Manhattan. I like the abstractness of the shadows and reflections. Greene St. has some of the best cast iron building in NY. 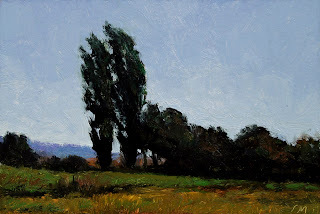 Southwest France#14, oil on linen/panel 5"x7"